Many women decide they want an epidural during childbirth. This is an effective form of anesthesia; however, there are some benefits, risks, and issues you should be aware of before deciding on this form of pain relief. An epidural is a form of regional anesthesia. The goal is to give effective pain relief and numbness below the waist. There are two main types: epidural blocks and combined spinal-epidural anesthesia (CSEA). This is the most common type of regional anesthesia for childbirth. Placement is done by inserting a catheter in the epidural space between vertebrae in the lower back. The medicine is usually a combination of a 'caine' (bupivacaine, lidocaine, ropivacaine and mepivacaine) and a narcotic. You will be asked to sit up and curl forward, often over a pillow. You will have to hold very still for the placement of the catheter, often through several contractions. The medicine is given by continuous drip or by repeat injections. Ask your care provider to find out which way your hospital delivers the medicine. Depending on the amount of medicine and your reaction to it, you should get pretty good pain relief. Good epidurals allow some movement of your legs; although, your legs will feel very heavy and be difficult to move. You should also feel the pressure of the contractions but no pain. A combined spinal-epidural is sometimes called a 'walking' epidural. The main difference between the two types is where the medicine is placed. The first dose of medicine is placed in the intrathecal space, which is the outermost membrane covering the spinal cord. The anesthesiologist then moves the needle into the epidural space and replaces the needle with a catheter which is then taped in place. This type of anesthesia does allow for more movement - usually with some assistance -- during the birth process. 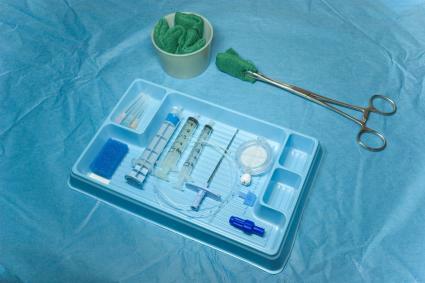 With this anesthesia set-up, you can also request additional epidural anesthesia at any time if the initial dose is not sufficient for pain control. These are good if you have a prolonged labor. If you have to have a c-section, you can still be awake during the procedure. An epidural can allow you to rest during your birth experience, which can lead to a more positive experience overall. Who Should Not Receive an Epidural? While epidurals can be a safe and effective form of pain relief, both do depend on the skill of the doctor administering the anesthesia. As with all medical procedures, there is a risk for adverse side effects; most are temporary and treatable. You may get a spinal headache if the epidural needle punctures the dura space. If this persists, your doctor may have to inject a little blood (a blood patch) into the epidural space. You may develop a backache, itching, or shivering. Nausea and vomiting can also happen after an epidural. An epidural may cause a drop in blood pressure. You will have to have your blood pressure taken every five to 15 minutes, depending on hospital policy. The lower half of your body will be numb for a few hours after the birth. This means that you won't be able to walk without help until you regain feeling in your legs. In rare circumstances, you may develop an infection after an epidural. There may also be permanent nerve damage where the catheter was inserted. In addition to direct physical side effects, epidurals may change your birth experience from what you may have envisioned. It is good to know how things may change so you can know what to expect. You may not be able to push as effectively. Without control of your pushing muscles, you may need forceps or a vacuum procedure. If you cannot push your baby out, you will need a cesarean. You may need to push for a long time. They are not administered on demand. You need to have lab work done, an IV has to be in place, and fluids have to be given before you can receive your epidural. You may not get the pain relief you want. You may only have pain relief down one half of your body, may still feel pockets of pain, or experience break-through pain. They are not designed to work as well during eight or nine centimeters, so they must be placed earlier in labor. They are designed so you feel pressure and not pain. Some women find the pressure of labor as uncomfortable as the pain. You will not have much feeling below your waist. This can make it difficult to get into a comfortable position. You may need a foley to help you urinate. Your labor pattern often slows down; however, some women relax enough for labor to quickly advance. Your hips and back may be sore postpartum from pushing in uncomfortable positions. You cannot have a home birth and an epidural. You cannot have a water birth and an epidural. The decision to have an epidural is a personal one. Although there are some side-effects, the pain relief can be effective for a woman in labor. You can decrease the risk of side-effects by waiting to get your epidural until you absolutely need it.